In this workshop artists will be introduced to the basics, and beyond, regarding the tools, techniques, and methods of creating with oil paints and cold wax medium. The layers of oil paints and cold wax are applied, scratched, scrapped, pressed, or gently layered in either a planned or intuitive way to create exciting textures, expressive marks, and unique surfaces. We will play, experiment, and create opportunities for happy accidents which occur almost effortlessly when oil paints and cold wax are combined. For beginners through advance artists. Bring your curiosity, an open mind, and a creative attitude. Barbara Bagan is an experienced and knowledgeable instructor. She is a member of several local art organizations, has taught university and studio courses, as well as designed and conducted various expressive art programs and workshops. After recently retiring as Professor in Charge of Expressive Arts Therapy at Ottawa University in Phoenix, she is now focusing her time on her art and teaching. 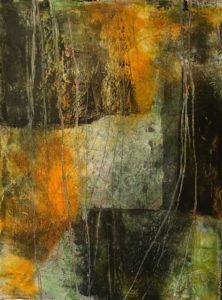 She exhibits locally and nationally and locally and has garnered awards and recognition for her watercolors, acrylics, alcohol inks, and pastels.